MiRCharge is a fully automatic charging station that lets MiR robots autonomously reload their batteries as needed. This small, non-intrusive charging station uses standard power and can be easily integrated into almost any environment. Your MiR100 or MiR200 robot will never run out of power in the middle of a job. MiRCharge 24V is a fully automatic charging station that offers flexible deployment options to meet your needs. The robot autonomously returns to the charging station and connects when its battery falls under established limits. It can also be programmed to regularly recharge between deliveries, such as when it returns to a stockroom or depot, which can allow the robot to run nearly continuously. 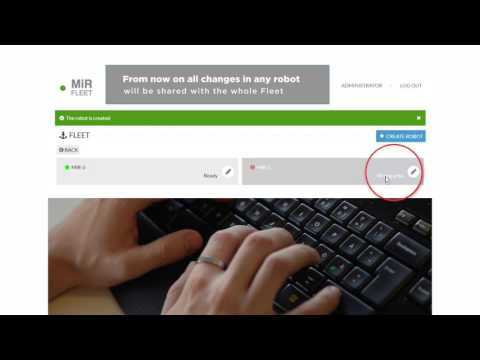 MiRCharge 24V fully charges a MiR robot in about two hours. 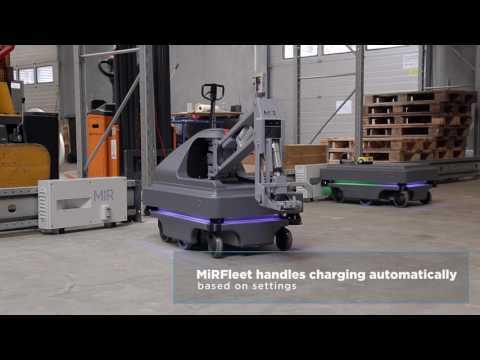 When multiple robots are deployed using MiRFleet, the system evaluates battery levels and job loads, optimizing utilization and recharging to keep the fleet on the job around the clock. MiRCharge 24V is easy and unobtrusive to install in your facility. It uses standard power outlets and its low profile and small footprint give you additional flexibility in how you power and deploy your mobile robot. Please select the software version you are using.